The GIGABYTE MW51-HP0 hails from the company's server-based product stack and is specifically targeted at users looking to build a professional workstation. Intel’s Xeon-W range of workstation processors started filtering into the market in Q3 2017, with models ranging from 4-cores (Intel Xeon W-2123) all the way to 18-cores (Intel Xeon W-2195). Note however that despite the naming, the new 28-core Intel Xeon W-3175X isn’t supported by the MW51-HP0 since that that chip uses a different socket. Overall the MW51-HP0's aesthetics follow a very simple black and grey theme with silver aluminum heatsinks set upon an all-black PCB. 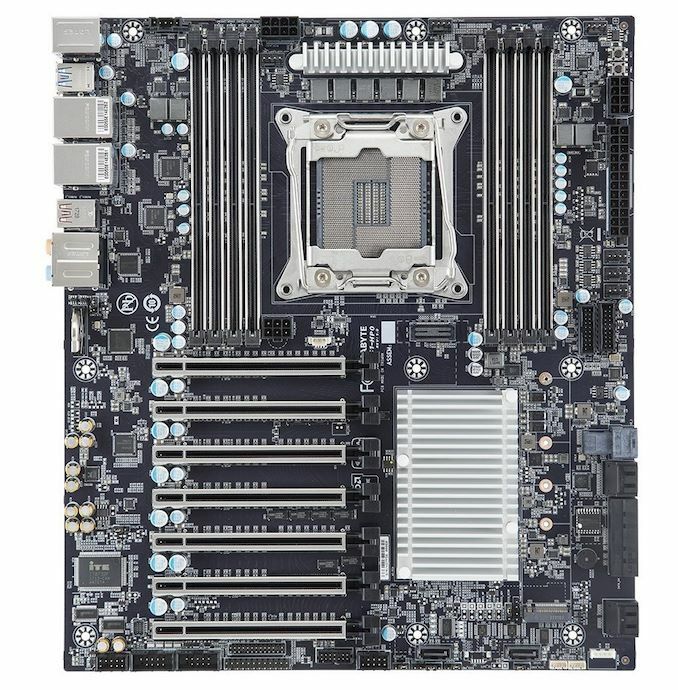 With a price tag of $567 from Amazon, the MW51-HP0 is a single socket workstation motherboard which offers professional features, of particular note being its seven full-length PCIe 3.0 slots, which are backed by a single Broadcom PEX8747 PLX chip. Altogether there are 64 PCIe lanes available, with the top three-slots taking lanes directly from the CPU and the remaining four being handled by the PEX8747 PLX. 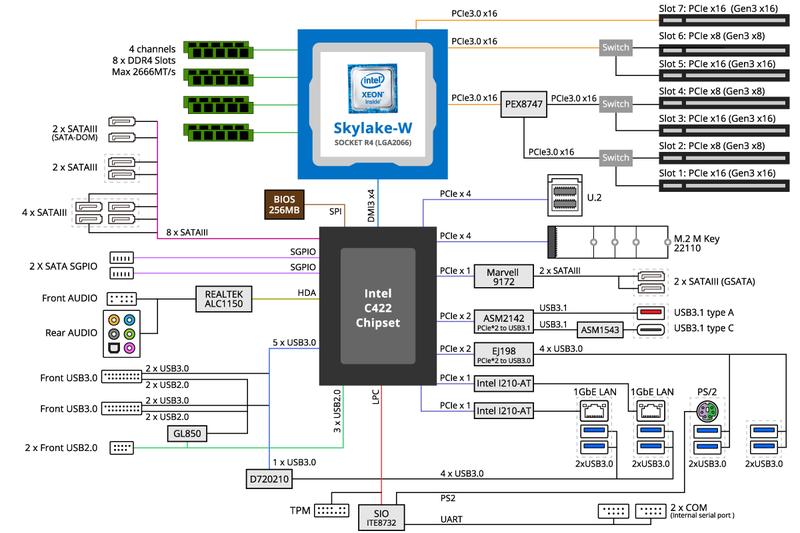 On the storage side is a total of ten SATA ports with eight direct from the C422 chipset and the other two controlled by a Marvel 88SE9172 SATA controller. Other options include a solitary M.2 PCIe 3.0 x4 slot with support for M.2 2242-22110 drives and a single U.2 connector with support for mini-SAS hard drives. Intel’s VROC is supported for users looking to use a PCIe RAID array including RAID 0, 1, 5 and 10. Memory-wise the GIGABYTE MW51-HP0 supports two types of DDR4 memory: RDIMMs up to 64 GB in capacity, and then LRDIMMs at up to 128 GB. A total of eight DDR4 slots are present and allow users to run memory in quad-channel memory mode, with a maximum capacity of up to 512 GB. The primary network controller set consists of two Intel I210-AT GbE NICs, which also offer support for teaming. Meanwhile audio support is provided by an older Realtek ALC1150 HD audio codec. USB support is extensive, with a total of sixteen ports supported and ten of those on the rear panel alone. These rear ports are split between eight USB 3.1 Gen 1 Type-A ports and two USB 3.1 Gen2 ports (Type-A and Type-C). As it's been a while since our last Intel C422 chipset motherboard review, the Supermicro X11SRA, our test suite has been upgraded. In our non-UEFI POST time test the GIGABYTE MW51-HP0 emerged with the shortest boot times among the boards we tested, including booting three times quicker than the Supermicro X11SRA C422 motherboard. The results in our DPC latency test also proved advantageous with a very strong showing in comparison to our other boards. And with our gaming tests – which are designed to show consistency – the 1080p results were exactly as expected, but at 4K the performance did seem a little off the mark by a couple of frames. Intel’s Xeon-W processors do not officially support overclocking due to being multiplier-locked. So the only way to overclock them is through the BLCK, and the GIGABYTE MW51-HP0 doesn’t include any overclocking options whatsoever. Compatible memory installed automatically runs at its rated speeds, so our Kingston 4x8GB DDR4-2666 CL19 kit's settings were applied by default, for example. 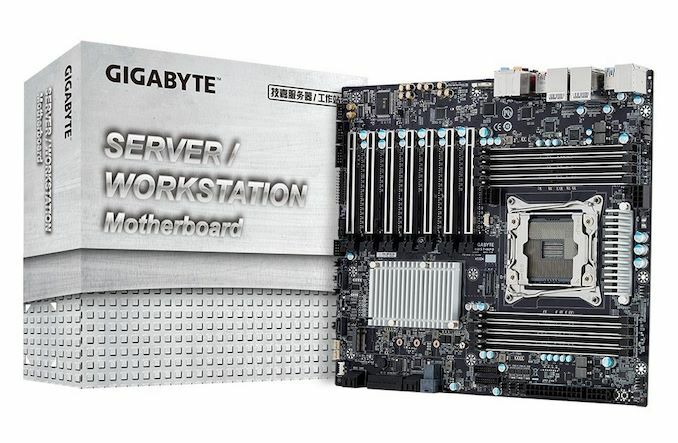 All told then, the GIGABYTE MW51-HP0 seems designed to be a serious contender in the workstation motherboard space. With its extra PCIe lanes, VROC support, and overall workstation credentials courtesy of Intel's C422 chipset, it can support the kind of heavy CPU grunt and graphics computational workloads required for virtualization, simulations and other heavy workloads. And while aesthetics aren't a priority here, for a price tag of $567, Gigabyte didn't skimp there either. So the board has all of its bases covered.